The patient lies supine with extended legs and relaxation of the muscles of the lower limbs. Hold one leg firmly above the knee joint with your left hand in such a way so the toes of the foot look towards the roof. The outer border of the sole is then stretched gently but firmly by the tip of a key. Starting from the heel, go along the lateral border towards the little toe and then turn medially across the metatarsal pad up to the head of 2nd metatarsus (never touch the ball of the great toe and the flexor creases of the toes) in a semicircular fashion. In hemiplegia / paraplegia (i.e. UMN lesion), the plantar response remains extensor life-long. 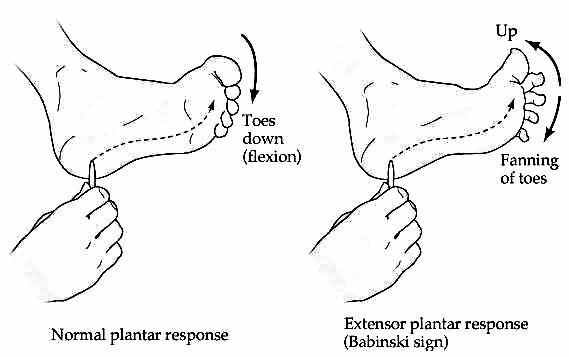 The efferent nerve of plantar reflex is tibial nerve for flexor response and peroneal nerve for extensor response.